There are two elements of battle in this novel. First, the main characters are often engaged in hand to hand combat, their chosen weapons usually being swords. To write these scenes with some historical accuracy, I studied different types of swords and their uses in combat. It helps that my husband collects swords and built his own forge in the back yard. The other element of warfare in Brother, Betrayed comes from the main kingdom being at constant war with the surrounding tribes. These battles I modeled after battles fought in the Crusades. 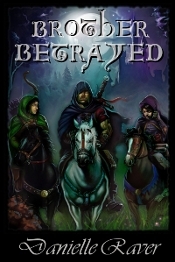 Though set in a fantasy world, there is a strong emphasis on knights, archers, cavalry, and siege weapons and tactics. 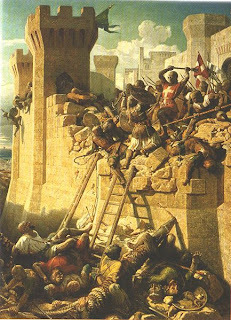 Several sequences in Brother, Betrayed were based on the Siege of Antioch, where a small number of soldiers defended against a large army in the First Crusade. Syah nodded again as he drew his sword. His mind moved ahead of his actions, calculating the trainer’s moves, his vulnerabilities with a larger, slower sword. The prince moved towards him, swinging his blade downward and stepping to the side. Malgar parried. “Good, and again,” he ordered. Syah turned and swung at him from the other side. The trainer parried again and the prince tried at him from a different angle. “Now faster,” Malgar ordered, stepping back to avoid the prince’s novice blade. The prince could feel his breathing grow shallow and his pulse quicken. He felt a rush of energy, his mind clear, thinking ahead of his strikes, evaluating and executing. “Good,” Malgar said, “now defend.” Syah changed his stance to block the trainer’s sword. He saw the man’s direction; he watched the position of his sword, predicting his actions. Syah felt satisfaction as he was able to block each of Malgar’s attacks. Syah shifted his sword as Malgar came towards him. The prince held his ground a moment, but stepped back after blocking several quick attacks. Malgar moved forward again. Syah glanced at the trainer’s face, seeing his eyes were narrow, resolute, angry. Syah tightened his hands on the hilt and continued to defensively position his sword to prevent Malgar’s attacks from following through. The weapons master pushed forward, but Syah was close to the wall and had no room to maneuver. The man’s flashing sword came at him faster; although the prince was able to block it, it was becoming more difficult. Syah tried to move to a more open position away from the wall, but his adversary’s sword prevented him. Malgar emitted a low, furious battle cry and Syah shuddered. Oman watched his men gather around him as the king left, awaiting orders. The king looked back to him after mounting. “Shall the skies shine on our victory today,” he said and tugged on the reins. “We shall let the king and his army gain ground. When the Marrians see him they will slow their advance. We desire our presence to be secret, so we will approach with care, and gain the opposite side of the hill, out of sight. It will be imperative that they see the king’s army first and decide to match them. We will attack at the opportune moment, giving their army a chance to pass us. 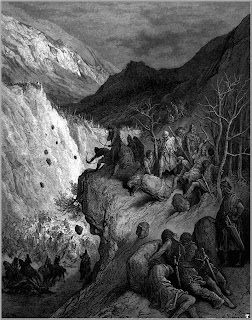 When the king’s army tears them down and they retreat, they will be exposed to our attack from the hill. Mount, we will ride until we can see the eastern hills in the distance. Tell the archers to follow behind us. Be wary of enemy scouts crossing the area.” The prince mounted and was followed by his host of soldiers and knights.